LUCY BURDETTE: A new book from SW Hubbard is always a cause for celebration--she's a smart, funny writer with a knack for creating strong characters. 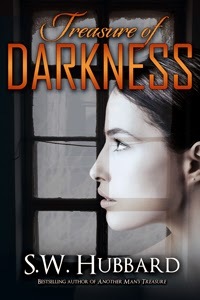 I've been hearing about the story behind Treasure of Darkness for a while, so I'm thrilled that it's finally available. Susan's visiting today to talk about where she got this idea--our fascination with 'stuff'. Welcome Susan! SW (aka Susan) HUBBARD: Who among us has not watched an episode of Hoarders and thought, “At least I’m not as bad as that!” Everyone has too much stuff, except for those owners of minimalist apartments featured in Architectural Digest (and I always suspect they have a back room filled with two Barcaloungers, a stack of unread newspapers, and Rubbermaid crates full of out-of-season clothes). Letting go of our stuff is hard because each item is more than just the plastic or metal or ceramic it’s made of. Some items are pieces of the past: Throwing away my daughter’s lacrosse stick was tantamount to discarding six years of chilly spring afternoons cheering in the stands. Some items are moral judgments: Discarding those perfectly good shoes that never got broken in is downright shameful when so many people have no shoes at all. Tossing the old waffle iron is fraught with peril: what if I have to make waffles for twenty-five and need two waffle irons to cope? And some items simply aren’t ripe for removal, so they go to the purgatory of the attic or the spare bedroom closet to await their future trip to dump hell. Still, as hard as editing our junk is, most of us manage to either toss it or at least recycle it via Craigslist or the church bazaar. But what if you could never let anything go? And what if you kept acquiring more and more? What would happen when your obsession affected not just your own life, but the lives of your family, friends, and neighbors? And finally, when you’d spent years accumulating so much stuff that every room in your house was filled to the ceiling, what might lie forgotten beneath it all? Those are the questions I wanted to tackle in Treasure of Darkness. So I gave my protagonist, estate sale organizer Audrey Nealon, a doozy of a job: find the one needle of value in a grotesque haystack of hoarded junk. In the process, she becomes entangled in the lives and secrets of the hoarder, his family, and his neighbors. One of the best things about writing fiction is that it gives me an opportunity to grapple with issues I can’t fix in real life. For fifteen years, I’ve volunteered at the Community Soup Kitchen of Morristown. The experience has opened my eyes to the suffering of the mentally ill and the terrible challenges faced by the people who try to help them. In Treasure of Darkness, I try to shed some light on these dilemmas. Unlike homeless animals and orphaned children, Harold the hoarder is not easy to love. He’s obstinate, unattractive, and tuned-in to a different logic than everyone else. The frustrations of his family and neighbors are totally understandable. Yet Harold’s essential humanity—his interests and intelligence and affections—are still present beneath the shroud of his mental illness. Audrey and her assistants, Jill and Ty, are torn by revulsion, fear, and compassion as they are drawn into Harold’s bizarre world. And, of course, since this is a mystery, they uncover some dark secrets along the way. You can meet Audrey, her crew, and Harold here, in the first chapter of Treasure of Darkness. The book is available in paperback and on Kindle here. I suspect you’ll see just a little bit of yourself in Harold. So come clean (so to speak)—what items do you find impossible to throw away? Wow, "Treasure of Darkness" needs to be on my teetering to-be-read pile. I think most everyone is, to some degree, a saver. For me, it's the things that connect me to those I love, the sentimental things that may not have monetary value but hold incalculable heart value . . . . Sadly, I am a horder of the worst order. Not as bad as the TV, but I'm getting there. Part of it is just plain laziness, too. I don't want to go through stuff and get rid of it because I'd rather be doing fun stuff. Hopefully, I can sort through some stuff for my church's upcoming sale and get rid of things I will truly never use again. Thanks, Joan--I hope you enjoy it. Remember, books are excluded from hoarding--you can never have too many :). I'm not as sentimental as I should be. Sometimes my kids (17 &21) catch me red-handed tossing out their grade school art projects. Mark, I feel you pain. Maybe you can find a cleaning Nazi friend who would enjoy helping you. Oh,I love your books, Sue! Can't wait to read this one. I prefer to call it the pack rat gene. I find it impossible to get rid of old letters and postcards. And office stuff (tacks, paperclip) that might come in handy. And then there are all my notes from workshops, master classes, writing events that I never look at again. But I get ready to toss them and think, well I SHOULD look at them again. Sigh. I'm pretty bad about stuff, especially clothes I'll never wear, old papers, and books. Hey,Susan! Off to read your chapter..sounds terrific. Welcome! And you know what I have trouble with ? Bags. SO ridiculous, but a nice glossy shiny bag from a store--I think--I can't throw that! It's so easy to re-use! But I hardly ever actually reuse them, and they just pile up the box. I am also haunted, because once I heard Ellen Degeneres on the Tonight Show complain about her dotty mother--and she was saying"And she saves BAGS! She says--they're so useful! And I tell her, mom, you're crazy, they are BAGS!" ANd so now I know Ellen would think I'm nuts. Winter coats. My foyer closet is crammed full. I am ashamed because every year the state police have a winter coat drive, and I should donate the entire closet. Best of luck with Treasure of Darkness! Harold's story is, sadly, more true and common than we like to acknowledge. It makes for a good read as well as something to think about after the final page. I think I am singularly unsentimental. I have no problem throwing away school art projects or papers (they have a shelf life and after that, good-bye unless they are really exceptional). Christmas cards? I tack them up, review over the holidays, then buh-bye. Clothes? Regular donations to St. Vincent de Paul or the church bazaar. Same with kitchen doo-hickeys - things I thought I absolutely needed and never used. I do have a collection of my grandmother's china teacups - those I can't part with, but they only take up one shelf of the china cabinet. I do have boxes (and boxes) of old photographs that I should, you know, go through and put in albums or something. You've exempted the thing that my husband and I truly have difficulty parting with - books! Treasures the boys gave me for special occasions--nicknacks I can't bear to part with. Photographs--although I've scanned most of the ones most dear to my heart--there's that word again--things that touch me, move me deeply. Sadly, hoarder behavior is everywhere--we have a relative whose house we cannot enter--there's only a pathway through the stuff, as well as 3 storage bins, one of which is for plastic containers. Another person buys houses and fills them with stuff he can't throw away, like cardboard cereal boxes. Like Susan, you wonder at the stories behind this accumulation--the weight of it fettering their lives and those of the people who love them in unimaginable ways. And what secrets, or treasures, or bodies ;-) might be hidden away in all the stuff. Long before email or texting, my mom and I used to write each other short, chatty notes about nothing much at all. When my mom died, I discovered she had saved every single note I ever wrote her. And I had read hers and tossed them. Then I cried. So Mary, you may regret you unsentimentality! Hi, Susan! I love the idea of an estate sale organizer. Congratulations on the new book! I save bags, but I reuse them. I save rubber bands, many more than I'll ever need in this lifetime. But mostly I get rid of things, sneak them out of the house when my husband is not looking. Just made 3 trips to Staples with old electronics. They say they recycle. I hope they do. What a good device to use in a mystery. Everyone knows about this kind of thing these days, but it used to be such a shameful secret. Two of my daughters are like Mary Sutton, unsentimental, out-you-go mentality about stuff. I'm surprised they still have the same mom some days. The other daughter is the opposite and cannot bear to let go of a single thing she's ever had, including her decades-old grade school papers. Then the people who lived downstairs from them decided to go away for a weekend, and they also asked me to look after their cats, and they gave me a key. I was FLABBERGASTED. Honestly, I don't know how they spent any time whatsoever in their apartment. There was junk, floor to ceiling, everywhere except for a path from the door to the kitchen, and another path from the door through the living room to the bathroom and one of the bedrooms. Everyplace else was completely stuffed with stuff. What floor space that was visible was covered with cat litter and God knows what else, and I finally realized where the stench came from that we kept smelling in the hallways, and where the roaches kept breeding. First chapter is fabulous. Need to read this. You nailed it with descriptions of why we save things - it has a special memory, we might need it, we just like it, buying it was a mistake but it was expensive so we feel guilty about getting rid of it . . . and all those reasons seem so logical to start. Until like now, when I am remodeling and wondering what I was thinking keeping so much stuff. I try to take a picture of a "thing" that I don't need or want but that has a special memory attached to it. That said, it's still hard to part with my treasures. By the way, I'm disappointed not to find this book on Barnes & Noble's site, since I'm a dedicated fan of the Nook. Susan, so interesting about those letters saved by your mom. People don't write notes so much anymore--it's our email boxes that are stuffed! Who in the world will ever want to sort through those? Harold the Hoarder in TREASURE OF DARKNESS also has cats, Karen. Cats and hoarders seem to go together, perhaps because having lots of pets feeds the same emotional need as having lots of "stuff." I'm sorry, the book is not on Nook. My Nook sales were not very strong for the first book in the series, ANOTHER MAN'S TREASURE, so I elected to go exclusively on Kindle. If you have an iPad, you can read it on there with the free Kindle app. And of course, there's always paperback! As for me, I don't have hoarder tendencies, but I am sentimental. For example, I still have every journal I ever wrote in. I still have my first "adult" jewelry box, which is filled with jewelry from adolescence through my 20s. The only 14k gold jewelry I own (I'm a silver person) are the dainty chain necklaces I bought for myself -- my first expensive buys with my babysitting money. I'm really pressed for time this morning, and I was only going to read the very beginning of chapter one, but, of course, I couldn't stop. Treasure of Darkness is definitely going on my TBR and wish lists. And, hey, why didn't somebody tell me that I could go all the way to the ceiling with junk? Hahaha! I am still in the middle of painting and new floors, and that has forced me to clear out closets and start the declutter process big time. Yesterday, I came across a basket of my son's childhood baseball, mainly T-ball trophies. He didn't even like playing baseball and I still have them. I told him if he wanted to keep any of them, he could look through them when he visits the end of this month. After that, they're out of here. It's items from my children's childhood and items from my parents' house that trip me up. Of course, I should mention that over half of my time reorganizing has been spent on books. That's really a whole other topic, my book hoarding. I was able to weed out enough in children's books for when my grandkids visit to one basket, and that was tough. I'm sure it will take at least another month to get the books even somewhat organized. Sue, I loved the first chapter! Now on my must-read list. Hoarding is a fascinating--and very difficult--illness. 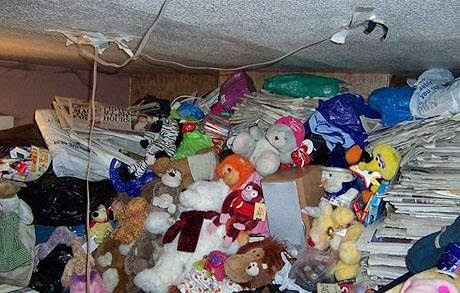 I've had several friends who have had relative who were true hoarders and it was a nightmare for the family to deal with. I had to laugh over the washing machine agitator--my husband keeps every part of anything that might "someday" be useful. Thankfully most of it is in the garage, AND we can still get our cars in there. Me, books, of course (but those don't count, right?). I have too much china. There are boxes of framed photos in the attic that need to be dealt with, and, oh, just generally too much stuff. I'm really working at de-cluttering. Count me as another S.W. Hubbard fan. Can't wait for this one. My brother says it says something about our civilization that we are so constantly preoccupied with having too much stuff. Talk about your first world problems! My mother was unsentimental, and what she did care about she displayed or used, yet cleaning out her house after she died was still a challenge. My mother-in-law is the opposite, keeps everything, and though she is still with us, my husband and I (and all her kids) have been cleaning up and cleaning out after her for years and years. When we find a bag of bags or box of boxes we're so excited because they can go straight into recycle without us having to go through them. I read the first chapter and got hooked! I do save "stuff" I probably shouldn't, but a lot of it is from sentiment. Not "I might need that someday." I do need to cull things out. My kitchen has more storage bowls, tools, and so forth than I'll ever need. I need to cull books too. Aargh. It could be worse. Moving always helps, and living in a house with no basement really helps! I'm enjoying hearing everyone's confessions! As part of my research for the book, I read a book called, appropriately enough, STUFF. It talks about the different types of hoarding. Harold, in TREASURE OF DARKNESS, is highly intelligent and thus can see the potential usefulness of just about anything, and can't let it go. I'm like that only with plastic containers--"No, no--don't toss out that smallish, oblong one. I might need just that size and shape for leftover asparagus!" Susan, actually, the newest Nook device, the Samsung Galaxy Tab4 Nook, reads every ebook format, including Kindle's. Which is just one of the reasons I support Barnes & Noble over Amazon, or Apple. Susan, you WILL need that one for asparagus! Not even a tough call! OH, the NOTES. Ah. What a story. I can completely envision that moment. Ah. Very intriguing . . . and spot on. I am in the process of whittling down the stack of newspapers (which accumulate when some author's book is just too good to put down). I've also made a bit of a dent in the "Room of Requirement" (second bedroom). The top kitchen shelves that I can barely reach have dishes I don't use. Someday when the great nieces/nephews are setting up homes, they can have those, and the kitchen set in the garage. I look forward to the treasure hunt in your book. I doubt my own clutter contains anything of great value, just a few $$ left in the bottom of some bags, of which I also have too many. ** Hank, I think Ellen would love you and not think you are crazy at all.